The Hardin County Agricultural Society met on Saturday, November 3rd with Craig Stump, Acting President, presiding. All directors present were sworn into office by Judi Cronley, notarizer. 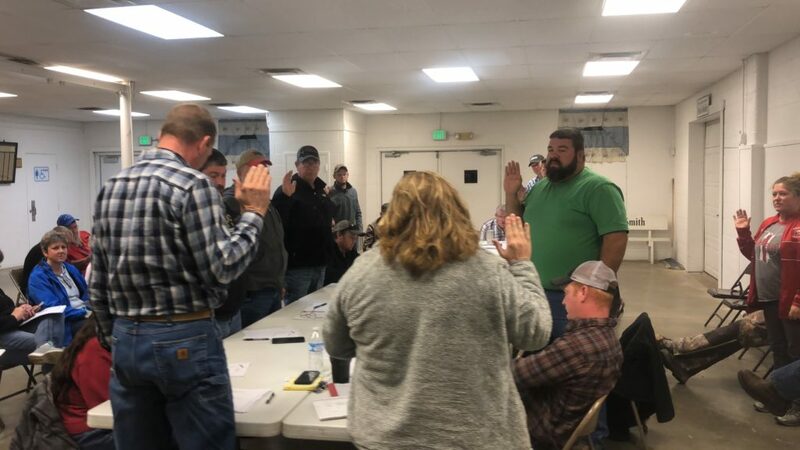 With 40 members paid for 2019, the election of officers was held. Dale Cockerell moved to nominate Corey Ledley for President and Andrew Scharf seconded the motion. Charlie McCullough moved to close the nominations, with Jack McBride seconding that motion. Motion passed. Rob Wilson moved to nominate Brad Murphy for Vice President and Charlie McCullough seconded the motion. Rob Wilson moved to close the nominations with Mark Garmon seconding that motion. Motion passed. Therefore Corey Ledley is the Board’s President and Brad Murphy is the Vice President. Paul Ralston and Jason Fulton moved to keep the regular board meeting date and time the first Wednesday night of each month at 7pm. Motion passed. Mark Garmon moved to adjourn the meeting and Charlie McCullough seconded the motion. Motion carried.